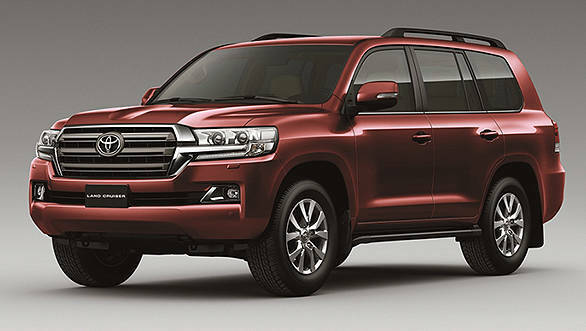 The updated Toyota Land Cruiser 200 has been launched in India at Rs 1.29 crore, ex-Delhi. That extra Rs 1o lakh over the outgoing car gets you a heated steering wheel, tyre pressure monitoring system, LED illuminated scuff plates and multi terrain monitor cameras. The facelift also brings in a new grille, redesigned alloys, LED headlamps and tail lamps. Inside, the cabin, Toyota have added a hi-res 4.2-inch touchscreen infotainment system, mood lighting and new upholstery. The updated Toyota Land Cruiser 200 gets the 650Nm 4.4-litre V8 which is mated to a 6-speed automatic and a full time 4WD. Toyota backs the Land Cruiser 200 with a three-year/1-lakh-km warranty. Speaking at the launch, Akitoshi Takemura, senior vice president, Toyota Kirloskar Motor Pvt Ltd said, "In our endeavor to periodically enhance our offering, we are delighted to introduce our top-of-the line Global SUV, the new LC 200 eighth generation with new design and equipment in India. LC 200 has earned the title of King of 4WD SUVs across the world due to its unmatched capability in tackling terrains both on and off road with equal aplomb. Globally more than 7.5 million happy customers have enjoyed owning Land Cruiser series over the last 60 years. In line with the changing lifestyle preferences of our customers, we are happy to introduce the new LC 200." · Advanced and Rugged NEW Exterior Design  Hexagonal Grille, LED Headlamps, New Design Alloys, Restyled Rear Combination Lamps · Sophisticated NEW Interior Design  New Larger Electro Multi Vision Audio with 4.2-inch TFT Info Display, Satin Silver finished Centre Console, New Interior Colors, New Design Steering Wheel Description: Description: C:\Users\tkm06519\AppData\Local\Temp\notesD30550\~7102459.jpg *Product may vary from the image as few features in the product are country specific Bangalore, October 30th, 2015: Toyota Kirloskar Motor today announced the launch of the All New Land Cruiser 200  the "Undisputed King of 4WD" with more advanced and sophisticated features. Other NEW Luxury Convenience Features Include Steering Wheel with Heater, LED Illuminated Entry System, Tyre Pressure Monitoring System, Enhanced Multi Terrain Monitor Cameras and many more. All these strengthen the essence of the undisputed King of 4WD and backed with a warranty of 3 Years / 100,000 kms whichever is earlier. Speaking on the launch, Mr. Akitoshi Takemura, Senior Vice President, Toyota Kirloskar Motor Pvt. Ltd. said, "In our endeavor to periodically enhance our offering, we are delighted to introduce our top-of-the line Global SUV the New LC200 8th Generation with New design and equipments in India. LC 200 has earned the title of King of 4WD SUVs across the world due to its unmatched capability in tackling terrains both on and off road with equal aplomb. Globally more than 7.5 million happy customers have enjoyed owning Land Cruiser series over the last 60 Yrs. In line with the changing lifestyle preferences of our customers, we are happy to introduce New LC200" The New Land Cruiser 200 will be available in two New Exterior Colors- Copper Brown & Dark Blue Mica apart from its existing colors (Super White, White Pearl Crystal Shine, Silver Metallic, Grey Metallic, Black, Attitude Black, Dark Red Mica Metallic & Beige Mica Metallic) and two New Interior Colors- Brown & Flaxen apart from the existing Black color. Priced at Rs. 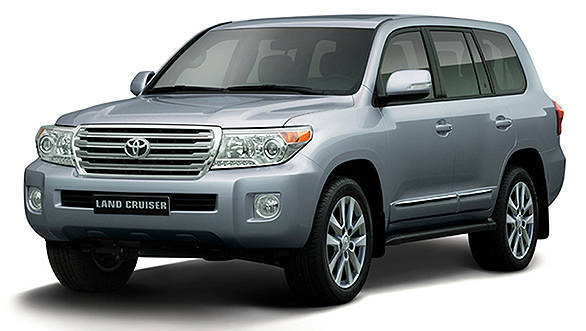 12,900,000 (Ex - Showroom Delhi), the New Land Cruiser 200 will be on sale from this festive season.